Diagnosis of angina pectoris accompanies a careful evaluation of angina pectoris symptoms. Coronary arteriogram/angiogram, stress test, ECG (electrocardiogram) is used to check the severity of angina and to establish a fact if there is any heart disease. The electrocardiogram is used to record electrical impulses of heart. The aim of this test is to confirm if heart is receiving enough oxygen or not and if there is any abnormality in the heart itself. Coronary artery disease is detected by a stress test for angina pectoris treatment. This test also determines the level of exercise safe for a patient. A contrast agent is injected to an artery in a stress test that helps to locate abnormalities, occlusions and narrowing of arteries. 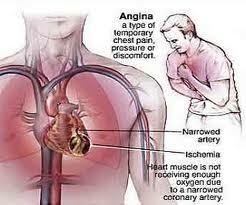 Many conditions resemble angina pectoris that create heart attack symptoms. Pain sources sometimes confuse with a heart pain and these sources are pericardial pain, pulmonary, musculoskeletal and gastrointestinal pains (biliary, hiatal hernia and esophageal).